Are we supporting moms enough? In too many places, the answer is no. As moms, we all want the best for our children -- but any of us can tell you we cannot do it alone, especially right after birth. 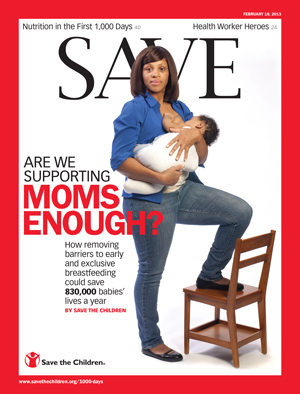 Last year, Time magazine's "Are You Mom Enough?" cover practically shouted "Scandal! Women breastfeeding too long!" The unforgettable image stirred up controversy and I'm sure it sold magazines. But are moms and kids any better off? Now, imagine funneling all that outrage and punditry into something that really helped mothers and their babies when it came to breastfeeding -- especially in the developing world where it can literally save lives. The real scandal is not breastfeeding late, but that too many moms don't get the support needed to breastfeed early -- or to keep breastfeeding, should they want to. In our new report, "Superfood for Babies," Save the Children estimates that 830,000 babies could be saved every year if they were breastfed in the first hour of life. The colostrum, or first milk, provides a powerful shot of antibodies that can stave off deadly disease. And immediate breastfeeding more often leads to exclusive breastfeeding for six months, which can save even more lives. These factors narrow breastfeeding choices that moms everywhere should be empowered to make -- including in the United States. In the developing world, the price is particularly high. A baby dies every 30 seconds for lack of protection breastfeeding provides against malnutrition and deadly disease. So let's change the conversation and pose a different question. Are we supporting moms enough? In too many places, the answer is no. One third of moms around the world give birth without the help of even one skilled health worker. In many communities, beliefs that the colostrum is dirty or that babies should drink (potentially contaminated) water or herbal tea rob them of "nature's first vaccine." Globally, we face a terrible shortage of trained health workers, and new mothers need their support. I remember so vividly the wonderful nurses in the Hong Kong hospital where I gave birth to my two boys -- helping me getting the hang of breastfeeding in those early hours and talking to me about the benefits. Moms in most countries, including the United States, have no guarantee of the internationally recommended minimum 14-18 weeks maternity leave. And workplace accommodations to support continued breastfeeding simply don't exist in much of the world, let alone protections for poor women working in the informal sector, such as domestic work or street vending. Our report finds continued violations of The International Code of Marketing of Breast-milk Substitutes, which was adopted by the World Health Assembly after outrage in the 1970s over aggressive formula marketing in developing countries. Today, violations include free samples and direct contact with mothers and health workers. Sadly, many women still don't have access to clean water or income needed to continue using formula properly. And although it's not the same matter of life and death in the United States, women who choose to breastfeed know how challenging successfully nursing after birth can be. Yet only, 6.7 percent of births here occur in "Baby-Friendly" facilities that meet international guidelines around supporting moms to breastfeed. As moms, we all want the best for our children -- but any of us can tell you we cannot do it alone, especially right after birth. Motherhood is not a competition, but a sisterhood and we do much to help each other tackle the challenges we face. That can extend beyond our own communities, where moms and their babies face the greatest risks. In his State of the Union address last week, President Obama pledged the United States would work with allies to save children from preventable deaths. Research shows that empowering more mothers to breastfeed is among the most effective steps we can take. So what can you do? Raise your voice for moms, at home and around the world. You can start signing a petition asking the United States to renew the 1,000 Days Call to Action. This groundbreaking initiative is helping countries create nutrition strategies that support breastfeeding and other low-cost protections against malnutrition. It focuses on the critical 1,000 window between pregnancy and age 2, but is set to expire in June. Your signature can help more moms save their own babies lives !